Live Steps Away from Algonquin College, and 10 Minutes from Downtown! Live right where you need to be, just steps away from Algonquin College campus and a short walk to Loblaw's, Goodlife Fitness, LCBO and so much more. Navaho downtown apartment rentals are 100% pet friendly and all pets are welcome, so you and your little friend can both feel right at home. Located right at the corner of Woodroffe Avenue near Navaho Drive, and just 10 minutes from downtown, you'll see how easy it is to get from this convenient spot to where you need to go. Get in touch today and see why an affordable Navaho rental suite might be perfect for you. Prices shown are best available, but may be limited to features, finishes, floorplan, availability and occupancy date. Prices shown reflect the average cost per room based on the number of rooms in a specific suite. The cost per room is based on occupancy equal to the number of rooms. Room rates may vary based on location in suite and square footage. These prices are subject to change without notice. Please speak to your Leasing Consultant or contact the Rental Information Line at 613-691-6434 for more details. Errors & Omissions excepted. The Navaho apartments offer a 100% pet friendly environment perfect for every animal lover. Enjoy the greenspace and parks located close to the property, take in a movie with friends in the onsite media room. The possibilities are endless at the Navaho rental suites! As of May 1st, 2018 all Navaho Apartments have begun the transition to 100% smoke-free. 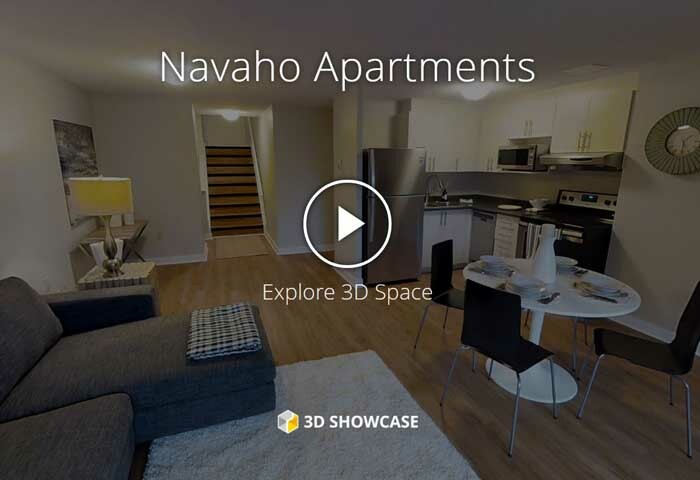 Join one of the most vivid neighbourhoods in Ottawa by choosing to live at Navaho Apartments. This Ottawa apartment rental has beautiful units, a convenient location and resides in a community filled with unique amenities. Single professionals and young families will gravitate towards the beautiful parks, gorgeous cycling trails that lead to the Ottawa River, and boutique shopping options that make the area one of a kind. Plus, running your daily errands is a breeze when you’re less than a 10-minute walk to groceries and more at College Square Mall. Students eager to avoid cramped dorms will love that these spacious and conveniently located rental apartments are around the corner from Algonquin College. When classes are finished, living at the corner of Woodroffe Avenue and Baseline Road means you’ll have your pick of amazing local pubs, restaurants and entertainment options to enjoy your free-time. If you want to venture downtown for some excitement, then you can step outside your door and onto one of the many buses that will take you from Ottawa’s West end to the rest of the city. If you’re looking for a convenient location, then this Ottawa apartment rental is perfect for you. Navaho Apartments provides quick and easy access to Algonquin College, College Square Mall, and other amenities along Baseline Road. Grocery and drug stores are a short walk away, with the LCBO, Loblaws and much more close at hand. The larger neighborhood is vibrant; enjoy community gathering events at George C Brown Park, follow a cycling path for scenic views of the Ottawa River or head over to Merivale Avenue to try one of many international restaurants. Whether you stay in the neighbourhood or use the Queensway to head downtown, we’re confident you’ll love the lifestyle Navaho Apartments provides. Navaho Apartments is located in the perfect spot for easy access to the neighborhood and city. In less than 10 minutes you can walk to College Square Mall, which offers all of the amenities you’ll need to finish your errands. A number of OC Transpo bus routes in the area will take you across the city of Ottawa, and if you’re travelling by car, then Highway 417 is only one block away and can get you around the area quickly. If you want something more leisurely, then grab a bike and try out one of the area’s many cycling paths that offer a scenic ride. The convenience of living in a West end Ottawa apartment rental is that all the essential amenities are a short walk away. In less than 10 minutes you can reach the local Loblaws, LCBO, Goodlife and Tim Hortons. Those looking to enjoy the outdoors or grab a drink will love that a number of major parks and bars are less than a 20-minute walk away. The West end is famous for its numerous bike paths which give residents a scenic and green way to get around. One of the best perks of these cycling routes is that they can help you reach the beach at Britannia Bay, and open up the possibility of a scenic ride along the Ottawa River. This Ottawa apartment building is ideal for car-owners who need to commute downtown; with Highway 417/Queensway only a block away, it’s easy to make your way into the heart of the city or to reach Kanata or Gatineau.